It has been a year since Betsy DeVos was sworn in as education secretary, and this month marks the first anniversary of our weekly education news roundup! Let’s pause to mark those moments … and then get on to this week’s headlines. While DeVos has in some ways made little progress on her signature issue — school choice — she spent much of her 12 months in office undoing work that she and many conservatives viewed as overreach by the Obama administration. Just weeks into her tenure, the Education and Justice departments rescinded Obama–era guidance aimed at protecting the rights of transgender students in public schools. As NPR Ed’s Anya Kamenetz and Cory Turner wrote in March, this decision was about a lot more than school bathrooms. Then, last fall, DeVos announced she would roll back policies on preventing sexual assault at schools and on college campuses that were instituted under the Obama administration. In 2011, and again in 2014, the Education Department’s Office of Civil Rights put stricter guidelines in place for how schools and colleges should investigate complaints. Colleges that didn’t follow them risked losing federal student aid. But some believed these rules treated students accused of sexual assault unfairly, denying them due process. The New York Times reported last month that three nonprofit advocacy organizations have sued DeVos over this issue. DeVos has also proposed changes to ensure that for-profit colleges get their due process. Victims of student loan fraud could previously file to have their loans wiped clean through the “borrower defense to repayment” program, but the department hasn’t reviewed any new claims since President Trump took office. As Inside Higher Ed reported in the fall, many students who borrowed from for-profit colleges are now stuck with loads of student debt and worthless degrees. DeVos came into the job as a longtime proponent of school choice. The administration has had little success in what was initially billed by Trump as a $20 billion plan to promote greater school choice. 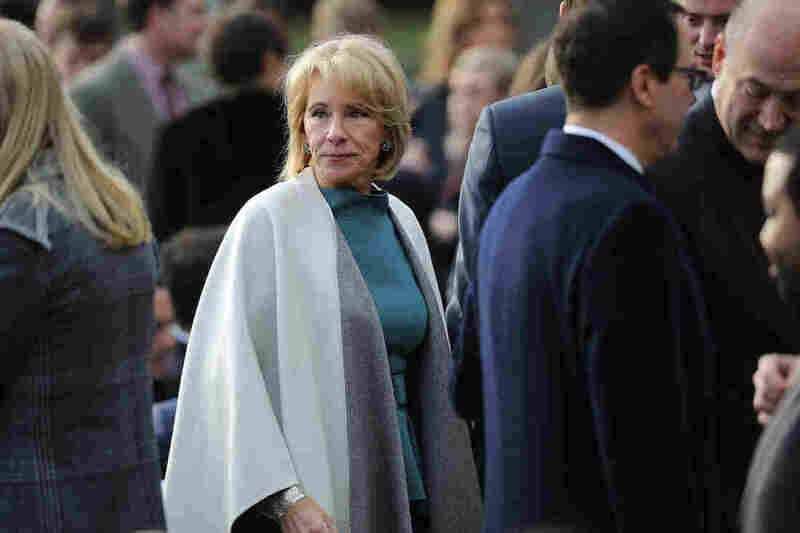 However, a win came in January, when the tax overhaul included a change to 529 savings plans, which families can now use for K-12 private schools. DeVos didn’t actually advocate a stronger federal role in any area of education, including in expanding school choice. “The future of choice does not begin with a new federal mandate from Washington!” as she put it recently in a speech at Harvard University. This week, thousands of teachers across the country led their students in events and discussions about race and justice in the United States, as part of a Black Lives Matter Week of Action in Schools. As The Washington Post reported, school districts including Seattle and Prince George’s County, Md., signed on to formally recognize the week. Individual teachers in Philadelphia, Baltimore and other districts designed their own lessons. On Facebook, a group called the Black Lives Matter at School Coalition summoned teachers to act. The group also has issued three demands to lawmakers, highlighting the changes they hope to see in schools: End “zero tolerance” discipline and implement restorative justice; hire more black teachers; require black history/ethnic studies classes for K-12 students. MinnPost reported this week that dozens of schools in Minnesota are under investigation for violating that state’s Human Rights Act. According to the website, Minnesota’s Department of Human Rights found that in the 2015-16 school year, “African American students were eight times more likely to be suspended than their white peers, while Native American students were 10 times more likely to be suspended than their white peers.” The department is investigating 43 districts and charters. Minnesota is far from the only state where racial disparities in student discipline continue to be a problem. Researchers have long connected these differences to “zero tolerance” discipline policies, and more and more districts are moving toward “restorative justice” approaches to keep students in school. Discussions about the value of humanities degrees have become “something of a cottage industry.” That is how a new report from the American Academy of Arts and Sciences opens. And it argues that many of those discussions rest on the assumption that the value of a college degree depends on a simple metric: a graduate’s earnings. But earnings were just one small part of the data that AAAS gathered for “The State of the Humanities 2018: Workforce & Beyond.” Researchers also compared employment rates, job satisfaction and overall happiness of college graduates. They found that although humanities majors do report slightly lower rates of employment and initially lower earnings, they’re just about as content in their jobs as all other college grads are.